Obverse: Bare head bust of Vercingetorix with wavy hair, left. Text below: VERCI-NGETORIXS. Reverse: Full bodied horse galloping left, spiral shape above. History: Vercingetorix, chief of the Arverni, led the great Gallic revolt against the Romans in 53-52BC. His name in Gaulish means ‘over-king of warriors’. He was eventually defeated by Caesar at the Battle of Alesia in 52BC and was imprisoned, he died in 46BC. There are less than thirty known staters that bear the Vercingetorix name. 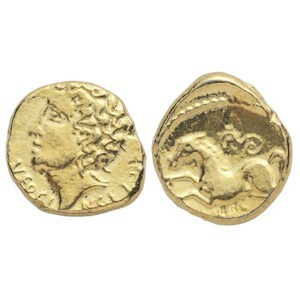 The free horse on the reverse symbolises the Arverni spirit of independence.